If you too can see the ripples in the water, it can mean only one thing: Jurassic Park is back. Continuing the legacy of one of the greatest sci-fi franchises of all time, director JA Bayona is heading to the lab to cook up a fresh batch of cinematic carnivores. Hoping to continue the success of 2015's Jurassic World, the newly titled Jurassic World: Fallen Kingdom will follow in the gigantic footsteps of its predecessors in a series we all grew up with. While there is still a bit of a wait until we hear John Williams's iconic theme again, the movie's colossal promotional campaign is finally starting to kick into gear. 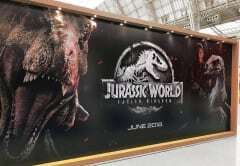 Snapped by Jurassic Outpost at a licensing expo in London, fans got a fresh look at who the stars will be in next year's extravaganza. Focusing on (arguably) its three biggest names, a brand new poster features Chris Pratt as Owen Grady, Rexy the T-Rex, and Blue the Raptor. Being the ultimate trifecta of unlikely heroes, the trio worked together to bring down that vicious Indominus Rex at the end of the first Jurassic World, and all will be back for the sequel. Sadly, for those hoping to see a new shirtless picture of Pratt, the image of Owen is actually ripped directly from the first movie — what, are we on a budget? The road to Fallen Kingdom has been a long one, and when the franchise seemed extinct after JPIII in 2001, many had given up hope that we would ever see Ian Malcolm's glistening chest ever again. Thankfully, Colin Trevorrow rebooted the series with Pratt and Bryce Dallas Howard as its leads, and life, er, found a way. Hype is high surrounding Fallen Kingdom, and some 25 years after Steven Spielberg's original movie, Jurassic junkies can't wait to open up those iconic gates for another archeological adventure. Digging up the bones of the past, Fallen Kingdom plans to introduce James Cromwell as the former partner of John Hammond, but also focus on a new era outside the confines of the theme park. With rumors of weaponized dinos and a hybrid even more deadly than the Indominus Rex, fans are just hoping that we don't stick frickin' laser beams on the raptors' heads. Interestingly, for the first time in the history of the dino-mite series, we are unlocking the cage doors and letting the beasts run free. Sure, we may have had that maligned trip to San Diego at the end of The Lost World: Jurassic Park, but Ja Bayona promises a very different change of direction for the sequel. With the return of B.D. Wong and Jeff Goldblum — *cheer* — Fallen Kingdom could have just the right balance of the old and the new to hatch another sequel and usher in the concluding chapter of a second trilogy. Either way, the fifth Jurassic Park film is expected to take a huge bite out of the box office when it hits cinemas on June 22, 2018.